This mechanical water pump is designed to have a maximum flow distribution. 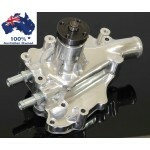 It is designed for use with factory alternators, power steering brackets, and our brackets. 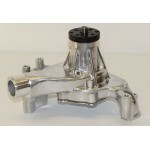 Made with aircraft quality 6061-T6 billet aluminum, this pump is designed to provide a perfect fit for your engine. 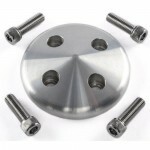 It is cut using CNC machining, which provides additional accuracy and a more sturdy construction. This process is also faster and more cost effective, making this water pump an incredibly affordable option. All these procedures and materials come together to create a 30% smoother System. WATER PUMP PULLEY COVER PLUS HARDWARE. 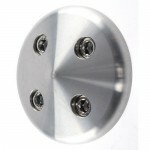 Billet Aluminium Ford Small Bloc..
Billet Aluminum Water Pump Pulley Cover - CHEVY This is an ideal solution if you ..